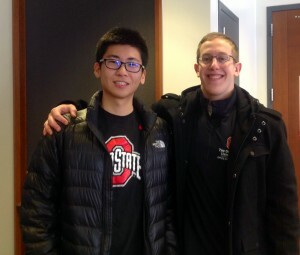 Andrew Kitay, a first-year honors student from Beachwood, Ohio and Xuan Kong, an international transfer student from Wenzhou, China were matched as Fisher International Friends conversation partners in Autumn semester. The result: the formation of a true and lasting friendship. Andrew and Xuan recently shared a little bit about their FIFCP experience. How did you hear about the Fisher International Friends English Conversation Program? Andrew: I actually found out in my Business Survey class through my peer advisor Sam O’Brien. It’s kind of ironic too, because he advertised the program as he matched up with someone that ended up becoming one of his really good friends and that’s what happened with me too so it’s kind of funny how things work out. Xuan: For me, I just went to the first session for transfer students and there is a flyer for the Fisher International Friends. I was looking for an American friend. I’m a transfer student from Iowa and I couldn’t find an American friend when I was in Iowa so I think this program is the best place for finding an American friend who is a good student and willing to accept more international friends and their culture and practice English. What motivated you to sign up for the program? Andrew: For me one of the things is…it’s crazy…there are a lot of international students here and you kind of here about it but a lot of times from my perspective, kind of like what Xuan was saying, that it is hard to find American friends. They meet up with people that they have things in common with, maybe they are from the same country – so just to kind of reach out and give a different perspective…that’s another reason why. Xuan: For me, I like to step out of my comfort zone because I would stay with my Chinese friends in Iowa. I think it’s not good because I pay a lot of money to be in America but always stay with my Chinese friend so I think this program can give me more American friends and share the different cultures, practice English…that’s great for me. Did you “click” right away or did it take a few meetings to become comfortable? Andrew: Yes it was a little lucky. Do you think that was just the luck of the match and both your personalities being comfortable with each other? Andrew: I think it’s a little bit of both. When people start talking you start finding things in common. I think we were lucky that we had more things in common but really a lot of people have things in common, they just don’t know it. Was there a challenge that you faced in your partnership at all and how did you overcome this? How frequently did you meet during autumn semester? Andrew: Usually once a week. Andrew: We always tried for at least one. What activities did you participate in together last semester? Andrew: We were really flexible I’d say. A lot of times it was a lot of meals. Xuan: Yeah…and swimming, working out. Did you mostly meet one-on-one or did you have other friends join you? Xuan: Yeah, the Michigan game. Andrew: We went together to the Michigan game. Would you say the Michigan game was one of your favorite things you did together? Xuan: One of the favorites. Andrew: I think the cool thing was every time, I think you’ll agree Xuan, every time we met up we just naturally talked about something different. We didn’t have to say “ok let’s talk about something different”…we just sometimes maybe went on a tangent but it was natural. Xuan: Sometimes we don’t even talk to each other, it still just felt naturally. You mentioned that you visited Andrew’s home – can you tell me more about that? Xuan: I just rented a car in Columbus and traveled the East Coast with my girlfriend. First destination is New York and then Boston and Niagara Falls. In Niagara Falls I text to Andrew “can we meet up together for a few hours, I can drive down.” I went to his home…his dad is really funny guy! He’s got a brother good at playing piano and my girlfriend, she’s a professional playing piano, so my girlfriend teach his brother playing piano. And by the way his mom is so nice! We had apples and cookies. Andrew: It was lucky that they were all home at the same time. I mentioned that he was coming, it was kind of out of nowhere, and they said “Ok, we’ll make sure to be here.” It worked out really well. That was definitely great. And sometimes Xuan is FaceTiming his dad or his mom and I’ll say “how’s it going” (waving his hand). Xuan (smiling): My dad, even he can’t speak English but he understands this. What is something interesting or fun that you learned about Chinese culture and that you learned about U.S. culture? Andrew: This is going to sound funny because it’s a little more general but a lot of things, he started talking about Chinese culture and I started talking about American culture and then we’d start talking about people that we knew with different personalities – some good, some bad – and everything started overlapping. It just seemed like so many things were in common. Xuan: Yes, people are people. Andrew: Exactly. That was one of the main things that we realized right away and it was definitely a repetitive theme. Xuan: I feel what races you are, where you are from, what culture you have, we just share the same stuff. Be sincere to everyone and they will be sincere to you. What have you learned about yourself as a result of your new friendship? Andrew: Kind of what we’ve been mentioning before, for a lot of people we are more similar than we are different at times. I realized that some people may seem like they are from somewhere on the other side of the globe or have some friend group that you couldn’t really fit in but that’s really not true. Once you get to know someone it’s endless possibilities. Xuan: So I’m Chinese and I just need to tell my friends “you need to be confident to American people.” They will assume sometimes that you are not really good at English so they will keep away from you but it’s not true. Once you build up the confidence, they are more willing to accept you. You assume that you won’t adapt to this environment but it’s not true. Do you feel more confident speaking English in the classroom now? Xuan: Yes. I just shout out, even if they don’t understand I try my best. How has your understanding of the international student experience changed as a result of having this new friendship? Andrew: I guess I had somewhat of a predisposition to think that when the Chinese students get together – kind of like you already touched upon, Xuan – they are speaking Chinese, they are not going to be speaking English and there is no reason for them to go out of their comfort zone when they can talk to each other. So from an American perspective I’m not going to go up to them while they are speaking Chinese and say “hey what’s going on” and it kind of pushes me back…it’s almost like you need to get out of your comfort zone to match on both sides. What advice would you give to newly matched conversation partners for making the most of their experience/time together? Xuan: Be confident. The first one is most important: be confident. Once you become confident, your English will become more fluent and everything will just come out. Xuan: We just kept looking for the topics…the topics came up in our own mind automatically. Andrew: I’d just say again that I got lucky because he is one of the nicest people…he’s very nice. Xuan: Yes I think we are lucky. He’s very nice too. Andrew: I tell my parents he has a heart of gold.